The three main titles for Mary used by the Orthodox are Theotokos (Greek: Θεοτόκος, lit. 'God-bearer' or loosely "Mother of God"), Aeiparthenos (Greek: ἀειπαρθὲνος, lit. 'Ever-virgin') as confirmed in the Second Council of Constantinople in 553, and Panagia (Greek: Παναγία, lit. 'All-holy'). Catholics use a wide variety of titles for Mary, and these titles have in turn given rise to many artistic depictions. 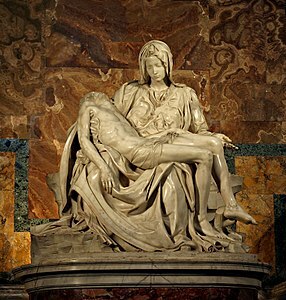 For example, the title Our Lady of Sorrows has inspired such masterpieces as Michelangelo's Pietà. ^ Glassé, Cyril (2008). "Mary". The New Encyclopedia of Islam (3rd ed.). Plymouth, United Kingdom: Rowman & Littlefield Publishers, Inc. pp. 340–341. ISBN 9780742562967. Retrieved June 2, 2016. ^ Smith, Scott. "Proving the Assumption of Mary". All Roads Lead to Rome. Retrieved June 19, 2017. ^ Henry, Matthew (1706). Luke in Matthew Henry commentary on the whole Bible (complete). Retrieved April 18, 2016. ^ Eric W. Gritsch (1992). H. George Anderson; J. Francis Stafford; Joseph A. Burgess (eds.). The One Mediator, The Saints and Mary, Lutherans and Roman Catholic in Dialogue. VII. Minneapolis: Augsburg Fortress. p. 235. ^ Clairvaux, Saint Bernard de (1476). Homiliae S. Bernardi super evangelio : "Missus est angelus Gabriel" - saint Bernard de Clairvaux - Google Boeken. Retrieved September 30, 2013. ^ Robert Van Voorst (April 13, 2000). Jesus Outside the New Testament: An Introduction to the Ancient Evidence. Wm. B. Eerdmans Publishing. pp. 122–. ISBN 978-0-8028-4368-5. ^ Ray, Nicholas (September 10, 1993). Rey, Susan (ed.). I Was Interrupted: Nicholas Ray on Making Movies. University of California Press. p. 230. ISBN 9780520916678. ^ Nicholson, Amy (August 1, 2018). "Olivia Hussey, star of Zeffirelli's Romeo and Juliet: 'I was wild'". The Guardian. Guardian News & Media Limited. Retrieved April 11, 2019. ^ Lindlof, Thomas (August 8, 2008). Hollywood Under Siege: Martin Scorsese, the Religious Right, and the Culture Wars. University Press of Kentucky. p. 57. ISBN 9780813173160. ^ "'Saint Mary' female lead Shabnam Gholikhani talks with ifilm". iFilm. December 18, 2017. Retrieved April 10, 2019. ^ Flynn, JD (February 6, 2004). "Actress who plays Mary speaks of filming 'The Passion'". Catholic News Agency. Retrieved April 10, 2019. ^ Johnson, Jason B. (November 7, 2006). "What race was Jesus? 'Color of the Cross' puts a different face on the debate". SFGate. Hearst Communications, Inc. Retrieved April 10, 2019. ^ Roach, Erin (November 30, 2006). "'Nativity Story' actress should not be shunned, leaders say". Baptist Press News. Southern Baptist Convention. Retrieved April 10, 2019. ^ Goodwyn, Hannah (2014). "Roma Downey and Diogo Morgado on Faith and Filming Son of God". The Christian Broadcasting Network, Inc. Retrieved April 10, 2019. ^ "Mary Magdalene attempts to wash away biblical character's stains of ill repute". Irish News. March 14, 2018. Retrieved April 10, 2019. ^ Rorke, Robert (March 20, 2019). "'Jesus: His Life' dispels beliefs about Christ and biblical history". NY Post. Retrieved April 10, 2019. The Finding in the Temple, also called "Christ among the Doctors" or the Disputation (the usual names in art), was an episode in the early life of Jesus depicted in the Gospel of Luke. It is the only event of the later childhood of Jesus mentioned in a gospel. The Gospel of James, also known as the Infancy Gospel of James, the Book of James, and the Protoevangelium of James, is an apocryphal gospel probably written about AD 145, which expands backward in time the infancy stories contained in the Gospels of Matthew and Luke, and presents a narrative concerning the birth and upbringing of Mary herself. It is the oldest source outside the New Testament to assert the virginity of Mary not only prior to, but during (and after) the birth of Jesus. The ancient manuscripts that preserve the book have different titles, including "The Birth of Mary", "The Story of the Birth of Saint Mary, Mother of God," and "The Birth of Mary; The Revelation of James." It is also referred to as "Genesis of Mary". The Feast of the Holy Family is a liturgical celebration in the Catholic Church in honor of Jesus, his mother, and his legal father, Saint Joseph, as a family. The primary purpose of this feast is to present the Holy Family as a model for Christian families.The Feast is held on the Sunday between Christmas and New Year's Day; If both are Sundays, the feast is celebrated on December 30th. Joachim (; "he whom Yahweh has set up", Hebrew: יְהוֹיָקִים Yəhôyāqîm, Greek Ἰωακείμ Iōākeím) was according to some of apocryphal writings the husband of Saint Anne and the father of Mary, the mother of Jesus. The story of Joachim and Anne first appears in the apocryphal Gospel of James. Joachim and Anne are not mentioned in the Bible. His feast day is 26 July. La Vierge is an oratorio (légende sacrée) in four scenes by Jules Massenet to a French libretto by Charles Grandmougin. It was first performed at the Opéra in Paris on May 22, 1880. 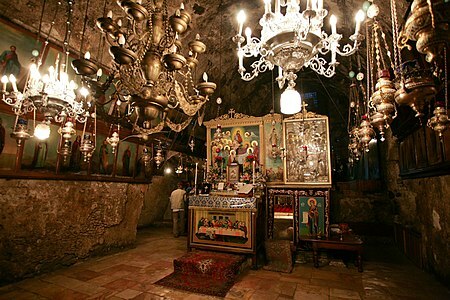 The oratorio is a recounting of the story of the Virgin Mary from the Annunciation to her death. In the first scene, Mary is visited by the Angel Gabriel and told that she will bear a son, Jesus. The second scene takes place at the Marriage at Cana where Jesus turns water to wine, and the third on Good Friday when Jesus is crucified. The fourth scene relates the Assumption of Mary into heaven. Although never popular as a whole, the orchestral piece "Le dernier sommeil de la vierge" (The Last Sleep of the Virgin) remains a popular encore piece to this day. A recording conducted by Patrick Fournillier was issued by Koch Swann in 1991, and the soprano Montserrat Caballé has revived the piece in concert in recent years. 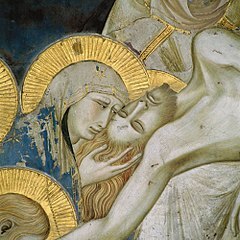 The Lacrimosa (Latin for "weeping", also a name that derives from Our Lady of Sorrows, a title given to Mary, mother of Jesus) is part of the Dies Irae sequence in the Roman Catholic Requiem Mass. Its text comes from the Latin 18th and 19th stanzas of the sequence. Many composers, including Mozart, Berlioz, and Verdi have set the text as a discrete movement of the Requiem. A Marian Cross is a term to describe a symbolic representation of the close connection of Mary, with the redemptive mission of Jesus. The letter "M" below the cross indicates Mary's presence at the foot of the cross. The transformation of water into wine at the Marriage at Cana or Wedding at Cana is the first miracle attributed to Jesus in the Gospel of John. In the Gospel account, Jesus, his mother and his disciples are invited to a wedding, and when the wine runs out, Jesus delivers a sign of his glory by turning water into wine. The location of Cana has been subject to the debate of Christ among biblical scholars and archeologists; several villages in Galilee are possible candidates. "Mary's Child" or "Our Lady's Child" is a German fairy tale collected by the Brothers Grimm in Grimm's Fairy Tales as tale number 3.The Brothers Grimm noted its similarity to the Italian The Goat-faced Girl and the Norwegian The Lassie and Her Godmother. They also noted its connection to the forbidden door and tell-tale stain of Fitcher's Bird. Other tales that make use of these elements are Bluebeard and "In the Black Woman's Castle".It is Aarne-Thompson type 710. Mary, Mother of Jesus is a 1999 American made-for-television biblical drama film that retells the story of Jesus through the eyes of Mary, his mother. Maryam (Arabic: مريم‎, "Mary") is the 19th chapter (sūrah) of the Qur'an and is a "Meccan sūrah" with 98 verses (āyāt). 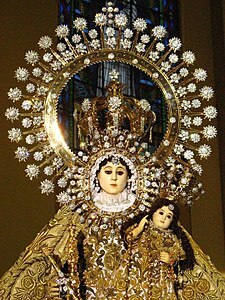 It is named after Mary, Mother of Jesus (Isa), who appears in verses 16–34. Theodor Nöldeke's chronology identifies this sura as the 58th sura delivered, while the traditional Egyptian chronology places it as the 44th. Mor (vernacular pronunciation) or Mar (from Classical Syriac: ܡܪܝ‎ Mār(y), written with a silent final yodh) is a title of respect in Syriac, literally meaning 'my lord'. It is given to all saints and is also used before Christian name of bishops. The corresponding feminine form given to women saints is Mart or Mort (Syriac: ܡܪܬܝ‎, Mārt(y)). The title is placed before the Christian name, as in Mar Aprem/Mor Afrem (Ephrem the Syrian) and Mart/Mort Maryam (Mary, mother of Jesus). The variant Maran or Moran (Syriac: ܡܪܢ‎, Māran), meaning "Our Lord", is a particular title given to Jesus, either alone or in combination with other names and titles. Likewise, Martan or Mortan (Syriac: ܡܪܬܢ‎, Mārtan, "Our Lady") is a title of Mary, mother of Jesus. Occasionally, the term Maran or Moran has been used of various Eastern Christian patriarchs and catholicoi. The Syriac Orthodox Patriarch of Antioch, the Malankara Orthodox Catholicos use the title Moran Mor. Sometimes the Indian bearers of this title are called Moran Mar, using a hybrid style from both Syriac dialects that reflects somewhat the history of Syrian Christians in Kerala. The Pope of Rome is referred to as Mar Papa by the Saint Thomas Christians of India. ܝ ܐ — ܐܝܬܝܐ, iṯyā, 'self-existence'In Mishnaic Hebrew through to date this Aramaic word is pronounced [mar] (Hebrew: מָר‎), and it is used as a formal way of addressing or referring to a male person. In the Gemara, Tabyomi is sometimes referred to as Mar. "Mar" was also the title of the Exilarch (leader of the Jewish diaspora community in Babylon), with the Aramaic-speaking Jews sharing many cultural attributes with the Syriac Christians. In the Modern Hebrew of contemporary Israel, "Mar" is used without distinction for any male person, like "Mr." in English. However, in Rabbanical circles of Jews from the Middle East, the Aramaic variant form מָרָן (Maran, Aramaic: our lord) is still a title to used for highly appreciated Rabbis, such as Ovadia Yosef, the spiritual leader of the Shas party. Joseph (Hebrew: יוֹסֵף‎, translit. Yosef; Greek: Ἰωσήφ, translit. Ioséph) is a figure in the Gospels who was married to Mary, Jesus' mother, and was Jesus' legal father. Joseph is venerated as Saint Joseph in the Catholic Church, Orthodox Church, Oriental Orthodox Church, Anglicanism, Lutheranism, and Methodism, and is also known as Joseph the carpenter. Some differing views are due to theological interpretations versus historical views.In both Catholic and Protestant traditions, Joseph is regarded as the patron saint of workers and is associated with various feast days. Pope Pius IX declared him to be both the patron and the protector of the Catholic Church, in addition to his patronages of the sick and of a happy death, due to the belief that he died in the presence of Jesus and Mary. In popular piety, Joseph is regarded as a model for fathers and has also become patron of various dioceses and places. Several venerated images of Saint Joseph have been granted a canonical coronation by a Pope. In popular religious iconography he is associated with lilies or a spikenard. With the present-day growth of Mariology, the theological field of Josephology has also grown and since the 1950s centers for studying it have been formed.In the Apocrypha, Joseph was the father of James, Joses, Jude, Simon, and at least two daughters. 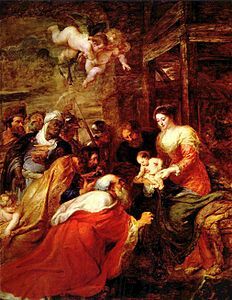 According to Epiphanius and the apocryphal History of Joseph the Carpenter, these children were from a marriage which predated the one with Mary, a belief that is accepted by some select Christian denominations. Tafsir Urwa-Tul-Wusqa is a tafsir (Islamic exegesis) claiming to disprove the virgin birth of Jesus by reference to Quranic verses. This contradicts traditional Islamic views of Jesus and of Mary. The text was written in Urdu by Abdul Kareem Asri, and Ahl-i Hadith scholar from Gujrat City, Pakistan. It incorporates the ideology of Sir Syed Ahmad Khan with traditional Ahl-i Hadith thought. The Gabrieliad (Russian: «Гавриилиада», Gavriiliada) is a humorous poem on the subject of the Annunciation widely believed to have been written by Alexander Pushkin in April 1821, while he was in his student years. The virgin birth of Jesus is the doctrine that Jesus was conceived and born by his mother Mary through the power of the Holy Spirit and without a human father. The Catholic church holds it authoritative for faith and Protestants regard it as an explanation of the mixture of the human and divine natures of Jesus, but the scholarly consensus is that its historical foundations are very flimsy. 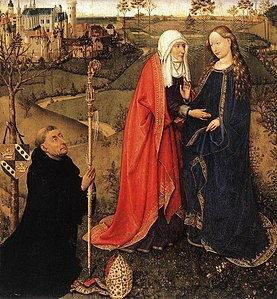 The Visitation is the visit of Mary to Elizabeth as recorded in the Gospel of Luke, Luke 1:39–56. It is also the name of a Christian feast day commemorating this visit, celebrated on 31 May in the West (2 July in calendars of the 1263–1969 period, and in the modern regional calendar of some countries whose bishops' conferences wanted to retain the original date, notably Germany and Slovakia) and 30 March among Eastern Christians. 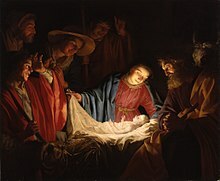 The episode is one of the standard scenes shown in cycles of the Life of the Virgin in art, and sometimes in larger cycles of the Life of Christ.